We all have the need to make our home look pretty and pleasing to the eye. 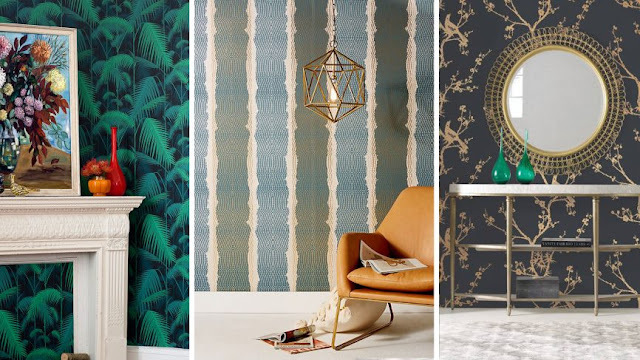 Wallpapers do the perfect job of making your home look classy, but choosing a wallpaper can be quite a handful of a task. Here are a few tips that can help you choose easier! Let the room decide- The first thing to keep in mind is interiors of the room. The color of the furniture and how you decide to accessorize your room should give you clues on what kind of wallpaper you would want to have in your room. The type of color you choose be it cool or pastel can help decide the kind of pattern and designs that would suit the interiors. The kind of climatic are you reside in also helps in choosing the intensity of the color for the wallpapers. Ambience- The kind of aura you want to portray through your room can help too. A room that you would use as an office could probably use wallpapers that are plainer whereas more exciting colors could be used to make the room look more prominent. A house that is overly lit could use more metallic shades whereas a darker home could use brighter wallpaper. Personal taste- Each person’s likes and dislikes can cause major changes in the house. Only the person who lives in the house can be the best judge of what would be the best for their home, be it a wallpaper or anything else.Sometimes the most suitable wallpaper can be the one chosen by instinct rather than when great thought is put into it. The pattern or design that of Wallpaper Singapore that feels homely to the onechoice is mostly the best one there is! Try first- The most important thing to do while deciding what wallpaper to choose is to check it first in the room. Once you have shortlisted a number of wallpapers, hand a piece of it on the wall. Take a day or two and notice which one looks more appealing to you. Observe how it works with the light and dark aspects of the room by stepping away from each pattern and imagining it in the entire room. This can help clear your perspective. Dimensions of the room- The length, width and height of the room should play a significant role in choosing wallpapers. A room which is comparatively smaller would do better with simpler designs; using too many patterns in such a room can make it look cramped. In the same manner, some patterns create an illusion of the room looking bigger than what it actually is, making the ceiling look higher. Small patterns make space in the room and larger patterns make it look cosier. Mix and match or play it safe- Wallpaper Singapore has something for everyone. If you are the kind to experiment then you can use more than one wallpapers, mixing it up the way you would like. At the same time if you are the kind of person who does not like to take risks you can choose a few safe patterns that you could not go wrong with, like stripes, plaids and more. These tips will help clear your mind and clarify the doubts that you might have had before. Once you have read all the tips and decided on your choice of liking, it is only obvious that these wallpapers will make your home look more beautiful.